Every day at 4 p.m. on the Volkswagen team at Shift Digital you might expect to hear Dealer calls, many clicks of a mouse and pounding keys on the keyboard, but you guessed wrong. Instead, you hear a conversation about which holiday each team member would eliminate if they had to eliminate one, and which Netflix show every person recently started binge watching. The Volkswagen team is not actually doing work, instead they are taking a productive “distraction break”. Do you ever leave work feeling drained because your day wasn’t as productive as you needed it to be? Often we end our days with a worn out feeling because we never completed our project for the day and had to tack it on to tomorrow’s agenda. Or because your friend at the neighboring desk distracted you with last night’s Bachelorette episode gossip. Surprisingly, according to some studies, the answer to a productive work day is not to tell your friend to leave you alone, but rather to give into their distraction. “Recent studies show that those who give in to some kind of diversion or distraction once an hour perform better than those who just keep at it without a break,” explained Huffington Post in their article 5 Science-Backed Ways Taking a Break Boosts Our Productivity. Without a proper distraction, staring at your computer screen all day is much like wearing clothes. Your eyes become too accustomed to what they have been staring at on a screen, just like your body stops noticing the feeling of clothing material on your skin all day. Both occur because your brain “…gradually stops registering a sight, sound or feeling if that stimulus remains constant over time,” (Sciencedaily.com). Now that we know a distraction is not a bad thing, what does a jar have to do with this? At Shift Digital, the Volkswagen team has the perfect distraction solution to keep their brains focused; not a jar but The Jar. A member on the team writes topic discussions down each week and fills the jar with the perfect distraction conversation starters. 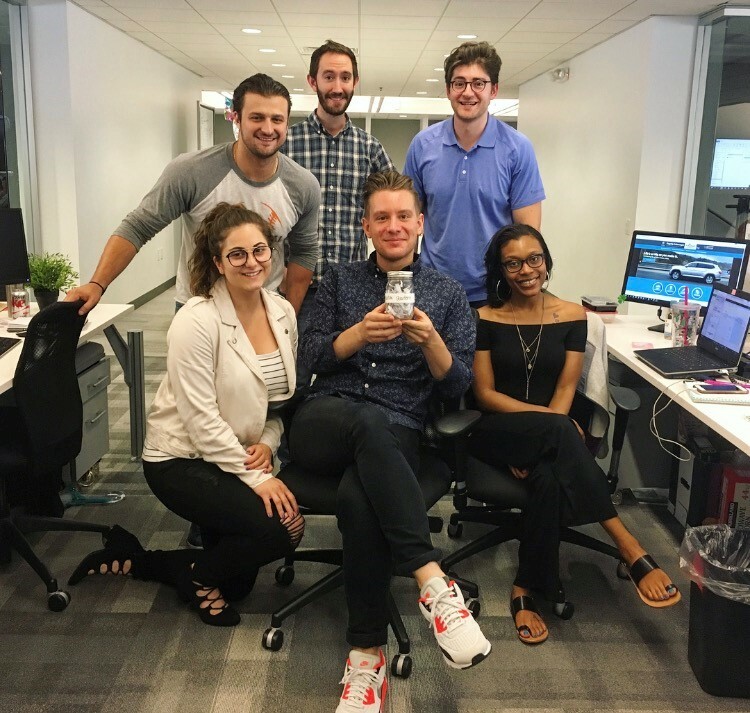 Each topic pulled out of The Jar helps to “…get some creative juices flowing towards the end of the day slump,” says Volkswagen team member, Andrew S.
The Jar began about a month ago when the team moved seats in the office to an area with some less familiar faces. What originally started as an ice breaker method turned into a daily 4 p.m. ritual. Each topic typically lasts around 15 minutes, but Andrew admits they almost always lead to more topics. From now on, you might find yourself rushing down to the Volkswagen team at 4 p.m. saying, “Did I just miss The Jar?” Whether you stumble upon a holiday elimination debate or a Netflix binge watching informational session, you are sure to have The Jar to thank for a more productive work day.